Nestled between an unspoiled rainforest of Coconut palm trees and cacao trees lies 6 apartments and 4 treehouses. Enjoy this tranquil retreat where every day is a “magical night and morning” with the songs of the birds and enjoying the stunning view of the surrounding plantations. Accommodation is ready for check in at 3pm and check out is 12pm. But you can enjoy the property starting at 730am. 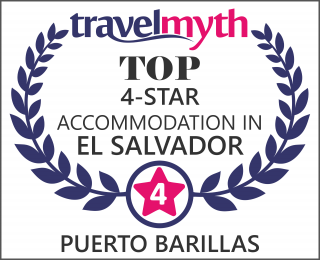 Consider staying a minimum of two nights nights to enjoy all Puerto Barillas has to offer and to take advantage of the many fun activities in the Jiquilisco Bay and Hacienda La Carrera area. Top Floor: One queen bed and one bunk bed and a half bathroom. First Floor: Social area and Full bathroom. Please note that the stairway is a snail-shaped stairway. If you experience mobility problems, we do not recommend this type of accommodation. Top Floor room -1 queen bed room with private spacious bathroom and a terrace. First Floor- Room with 1 Queen bed and bunk bed or 2 full size beds (subject to availability) and a private bathroom, a sofa bed in the living room and a fully-equipped kitchen. Please note we have a service fee for third party providers. Please consult it at the reception desk. 0-5 days before arrival, the reservation is non-refundable. For Holidays (High Season)- non refundable rates. Semana Santa (complete, varies year to year), August (complete week), from 27th of December – 2nd of January. We understand that sometimes unfortunate emergencies arise, such as personal illnesses or of a close family member (father, mother, children) or death of a close family member (of the people mentioned above). In this case, we must receive a certified doctor’s letter of death certificate. The doctor will be verified. 48-24 hours prior to arrival, 1 night plus administrative fee of $35.00 will be charged. High Season (holidays): No refunds for the whole stay, completely non-refundable rates. We are in a remote area, it is almost impossible to sell rooms of last minute cancellations.